Unlike the first Civil High Commissioner in Malta Sir Alexander Ball (1757-1809), who endeared himself with the Maltese, the first colonial Governor of Malta Sir Thomas Maitland (1759-1824) was very unpopular and there was no love lost between him and the Maltese. Maitland’s thirst for autocratic powers knew no bounds, which even antagonised the large number of British expats who came to Malta as top administrators or representatives of established shipping and commercial lines. A drawing of eminent Gozitan scholar Canon G.P. 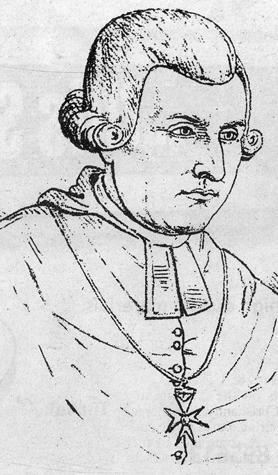 De Soldanis (1712-1770), who in 1750 published a catechism book in Maltese, supported by Bishop Alpheran de Bussan. King Tom, as he was known, assumed not only the governance of the Maltese islands but was also Lord High Commissioner of the Ionian Islands in Greek waters and he also administered all the British consulates in North Africa. He further alienated the staunch Roman Catholic clergy and the entire Maltese population with his arrogant attitude towards the Church in Malta. I vividly recall a scholarly exhibition held at the Mdina Cathedral Museum 15 years ago, which provided enough material to demon­strate the complex and arduous course the ‘Word of God’ in the local vernacular had to take, starting with G.M. Canolo in 1822, who published his Maltese translation of the Gospel of St John in London. This highly researched exhibition, or­ganis ed by then curator John Azzo­pardi, affec­tionately known as Dun Ġwann, was held at this prestigious museum which houses an early 13th-century Codex of the Gospels, which is of great historical and artistic value. It was the gospel on which solemn oaths, such as the oath of office, were taken by Università officials in the Middle Ages. The exhibition highlighted a momentous period in the history of Maltese Christianity. The early years of British rule in Malta were characterised by bitter recriminations about the rights of the Protestant Church, the official religion of the island’s new masters. This necessitated the urgent provision of a suitable place of worship in Valletta. The conventual church of St John was considered by successive early governors as a prize of war since it had belonged to the Knights; consequently they cast envious eyes on it in order to serve the religious needs of Protestant residents. By 1826 not only did the Protestant Movement hold its meetings at the Governor’s Palace in Valletta but through connections in the British Parliament they raised the matter in London. 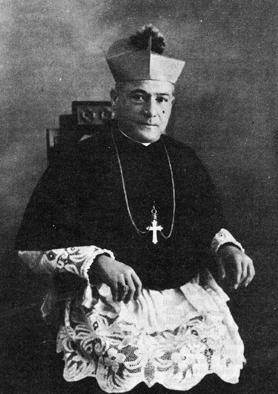 Archbishop of Malta Dom Mauro Caruana, who in 1917 issued a ban prohibiting MUSEUM members from studying the Bible. The prohibition was later lifted. In 1808 Britain gave permission to the London-based Protestant Bible Society to establish a branch in Malta and they were particularly active in Floriana and Cospicua, where army and navy personnel were numerous. The Church Missionary Society of London was at the same time very active in its mission of promoting the diffusion of the Bible in English, one of the basic tenets of the English Reformation. In such a climate the translation of the Bible into Maltese was a very sensitive issue. It has to be viewed within the strict constraints of the period when zealous members of these societies made their presence felt with huge numbers of Bible books in Maltese and Italian printed in London. 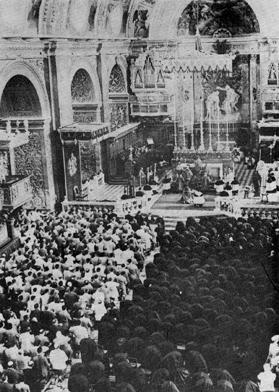 Many of the signals sent out by these events are at times confusing but one message stands out loud and clear – the Bible matters... and some audacious Maltese writers took bold initiatives and made some feeble attempts, at times prompted by the Protestant Movement in Malta, at translating parts of the Bible into the ‘demeaning language of the uneducated masses’, which formed the majority of the local population. One of the first of these pioneering visionaries was M.A. Vassalli (1764-1829), a convert to Protestantism, who in 1829 published anonymously in London his translation of the four Gospels and Acts of the Apostles. He died a few months later and was refused a Catholic burial. St George Preca, the greatest contributor to the wide diffusion of the Bible in Maltese. Of course, pride of place in this regard goes to the eminent Gozitan scholar canon G.P. Agius de Soldanis (1712 -1770), who pub­lished the oldest known manuscript text of the Bible in Maltese – the psalm Miserere. In 1750, De Soldanis published his Maltese alphabet and grammar mainly with the aim of highlighting the benefits of a uniform method for the teaching of catechism in Maltese. It has to be noted that following the publication of De Soldanis’s grammar and alphabet, the erudite Bishop Alpheran de Bussan immediately took the necessary action to publish in Rome at his own expense the standard text of De Soldanis’s Christian catechism in Maltese. The local Church at that time considered the study and translation of the Bible as a closely guarded enclave in which laymen were completely banned, particularly if this activity was instigated by the Protestant Bible Society, whose finances supported the publication of the Bible in Maltese and Italian for local distribution. Riccardo Taylor (1818-1868), who had the audacity to publish his Maltese translation of The Lamentations of Jeremiah at his small printing press in 1844, died in Vittoriosa a miserable pauper and could not even be buried in the local church as was customary in those days. Taylor was the first Maltese translator of the Holy Scripture to publish his work in Malta. A relatively unknown visionary who published religious literature in Maltese in the 1870s was Mgr Ludovico Mifsud Tommasi (1796-1879) of Cospicua. He wrote and published common prayers expressing the purity of the Maltese language, like the Att ta’ l-Indiema (Act of Contrition) and rhymed prayers in honour of village saints, popularly known as kurunelli. 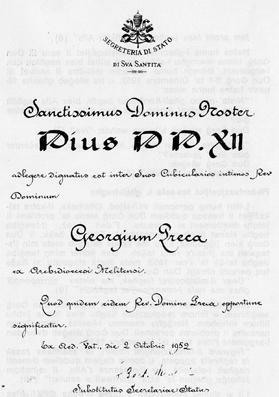 A document showing a signal honour conferred on Dun Ġorġ Preca by Pope Pius XII, which saddened the saintly priest, who silently resented earthly honours. Undoubtedly the greatest contribution to the wide diffusion of the Bible in Maltese was that of St George Preca (1880-1962), who founded the Society of Christian Doctrine (MUSEUM), a religious institution of laymen, and eventually lay-women, to teach and dedicate themselves to evangelisation. 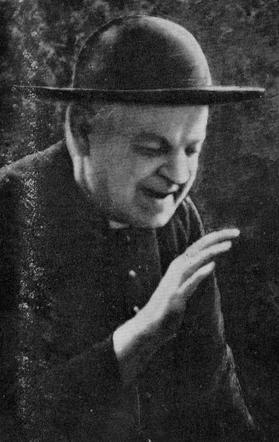 The strictures imposed on him by the local Church caused him a lot of anguish and deep sorrow, especially that of a formal letter dated March 6, 1917, in which Archbishop of Malta Mauro Caruana and former vicar of Fort Augustus in Scotland decreed that: “è abolito per soci lo studio… della Scrittura” (The study of the Scripture is prohibited to members of the Society). Preca’s strict obedience, tenacity and resilience caused him great pain, but in due course his pastoral work in the evangelisation of the masses was vindicated. He collaborated with eminent biblical scholar from Żurrieq, Peter Paul Saydon (1895- 1971), whose literary rending of the Bible in Maltese from the original Hebrew, Aramaic and Greek prompted the University of Malta to confer on him the prestigious title of Doctor of Literature. The citation referred to Saydon’s erudition and enormous contribution to Maltese scholarship. St John’s Co-Cathedral. An impressive gathering of MUSEUM members celebrating the 50th anniversary of the Society of Christian Doctrine. The women members are seated on the right wearing their black faldetta (għonella). This close collaboration was later acknowledged by Saydon, who confessed that he would have stopped his masterly translation of the Scripture were it not for the tangible support he was given by MUSEUM members, who bought a substantial number of copies of Saydon’s academic translations. Prof. Saydon’s complete Maltese Bible – Il-Kotba Mqaddsa bil-Malti (1929-1959) is a highly literary work that exposes the beauty and purity of the Maltese language. I must confess that I belong to a spiritually illiterate and sterile civilisation, particularly because in my boyhood the only exposure to the Gospels was the sentenzi or ‘words of Christ’ which Dun Ġorġ, at great personal sacrifice, prepared for his MUSEUM members to pass on to us.